Interpretive Trail at Randall Preserve – At the southern-most end of Puget Sound on Eld Inlet is Randall Preserve—seven acres of tideland estuary and shoreline. This once heavily used site had buildings on it, and the shoreline was hardened with hundreds of tires. Its shores are now being transformed, restored into high-quality habitat for migratory birds, fish and animals. Plan a visit to Randall Preserve to enjoy the scenery and wildlife! Open from dawn till dusk. Keep pets on leash and dispose of waste properly. Location: 4939 Mud Bay Road NW, Olympia, WA 98502 Free parking is available at the site. The Interpretive Trail is a flat trail covered in bark mulch. The approximate trail distance is: 560 feet / 0.1 miles. Darlin Creek Preserve Trail- Darlin Creek Preserve protects hundreds of acres of healthy forest, 70 acres of diverse wetland habitat, Lake Lucinda, important wildlife habitat for state and federally listed species, and more than 2 miles of fish-bearing streams: Darlin, Dempsey, and Pants Creeks – all Black River tributaries that run through the property. No hunting, fires/fireworks, camping or motorized vehicles. No removal of vegetation or mushrooms. Location: 8910 Lake Lucinda Drive SW, Olympia, WA 98512. Free parking is available at the site. Hilburn Preserve Trail- Hilburn Preserve protects nearly 10 acres of important land along rivers and streams as well as instream habitat, just below the old Goldsborough Dam site. The Goldsborough Dam was removed in 2001 opening up 25 miles of stream channel to fish access. Plan a visit to Hilburn Preserve today! Location: W Hulbert Road Shelton, WA 98584. Free parking is available at the site. 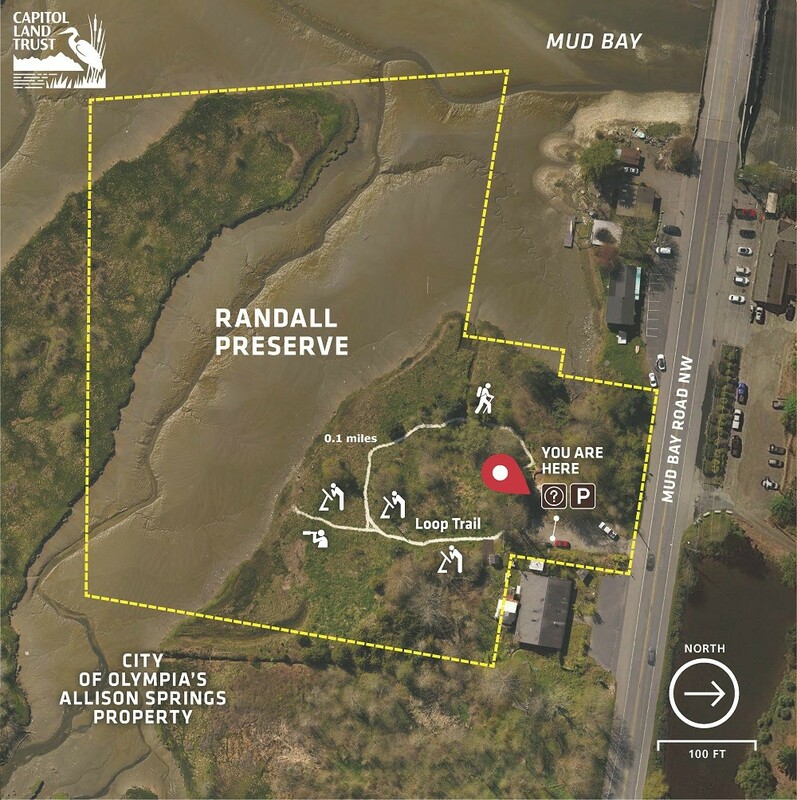 Bayshore Preserve – Interim use– While trail improvements have yet to be made on this 74-acre property, visitors are welcome to come and enjoy views of Johns Creek and Oakland Bay while witnessing Bayshore Preserve‘s transformation from golf course to nature preserve. 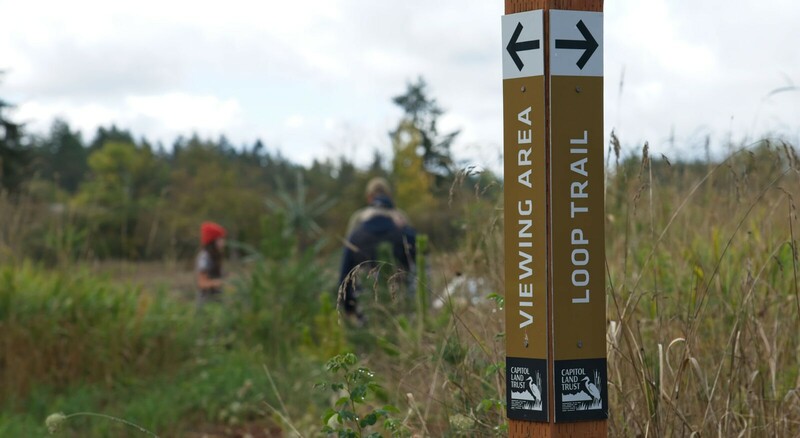 Long-term plans for the preserve include an ADA accessible trail, viewing platforms, and covered structures to support environmental education programming already taking place here. Fishing is not allowed on the property but Capitol Land Trust does provide access via a trail to public land for fishing at the mouth of Johns Creek – see maps on kiosk for directions. No hunting, fires/fireworks, camping, or motorized vehicles. Avoid walking in active restoration areas – stay on existing trails. Location: 3800 WA-3, Shelton, WA 98584. Free parking to the right of the gate facing a wood and metal mesh fence.